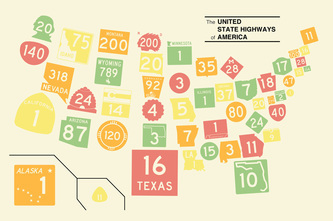 A map of 50 states and the District of Columbia created with state highway markers. The standard sign for a state highway, according to the Manual on Uniform Traffic Control Devices, is a simple circle with a number in it. Fortunately, states are free to create their own markers, and many opt for something unique. One common approach is to use the outline of the state around the route number, which quickly identifies the road as a state highway. 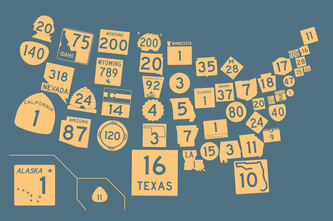 It also raises the question--what happens when you put those state-shaped signs together into a map? 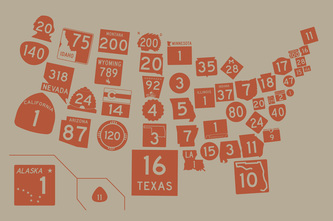 This state map of roads makes a perfect companion to my road map of states. For aesthetic reasons, this graphic eliminates the distinct colors several states use (sorry, Vermont and Minnesota). But the good news is that the map is available in four unique colors: Interstate Green, Slate Blue, Rust, and Classic Map (matching the United Streets print).